The out-of-home market Germany has experienced a satisfying year 2008. The latest market volume of 58.6 billion Euros should have risen slightly again, according to first projections. Gastronomy and lodging (commercial food service) make up the largest part with 41.8 billion Euros – with an average annual growth of 2.8 percent. Community catering accounts for 14.6 billion Euros and grew by an average 1.6 percent in the previous years. The out-of-home market Germany is divided into one third catering in community facilities and two thirds commercial food service, totaling over 328,000 units. … that of the 60,413 restaurants, 2,835 houses belong to the premium segment? … that there are 34,201 pubs, but only 2,718 bars? … that 68 percent of the almost 39,000 lodging establishments are privately run? … that 82 percent of German hotels offer less than 50 rooms and one percent offer 250 rooms and more? … that in the non-commercial segment of education there are over 700 people who care for 1,86 million students? … that there are more than 100,000 establishments offering snacks for immediate consumption or take-away? The out-of-home market spans a revenue volume of 1,588 billion Euros world wide. That corresponds to a per-capita revenue of 240 Euros with a world-wide population of 6,630 million people. The largest revenues are being generated in North America (33.7%) and Western Europe (18.9%). In absolute numbers, this reads as follows: 1,287 Euros of average revenues in North America, 815 Euros in Western Europe. In Germany, Austria and Switzerland, the average revenue is 804 Euros per person. The Western European share of world-wide expenses in the out-of-home market amount to 330 billion Euros with a population of 405 million. In North America, 431 billion Euros are being spent annualy (total population of 335 million). The average transaction in Germany is 14.50 Euros per restaurant visit. But: „A third of pubs has to get by on an average revenue of under eight Euros – after, in part, heavy losses in revenues due to the smoking ban,“ Thilo Lambracht, Director of CHD Expert / Marktplatz Hotel GmbH, points out. In Great Britain, guests are spending about 40 percent more per restaurant visit in comparison (23.60 Euros). Undoubtedly, prices at restaurants have risen considerably over the last years. At the same time, however, a growth of the out-of-home market can be observed across the continent – with demanding full service restaurants ranking among the winners in almost every Western European country. The average transaction in French hotel restaurants, e.g., amounts to 26 Euros and is thus almost 20 percent higher than in other restaurants. The average length of stay of guests in pubs and restaurants has decreased slightly in 2008. Almost two thirds of guests of à la carte restaurants stay for a maximum of two hours. The fraction of long-term guests (two to four hours per stay) is only 16 percent. Most guests in gastronomy are older than 40 years of age. Only around a third of pub and restaurant visitors are of the „party age“ between 18 and 39 years. In bars, clubs and lounges, however, the percentage of people up to 39 years is significantly higher. About 65 percent of visitors of à la carte restaurants are 40 years or older. The proportion of people over 60 years is especially high in pubs with 22 percent, while only 12 percent of this age segment frequent bars. Around 53 percent of guests are male, 47 percent female. Depending on the type of gastronomy, the gender distribution varies greatly: In bars, clubs or lounges, there is a surplus of men (59%). Ladies, on the other hand, are more frequently found in cafés (55%). In pubs, the ratios are even more obvious: 63 percent of guests are men. The hotel industry draws profits from the trend to coffee specialties in all their facades – espresso, cappuccino and latte macchiato. While a cup of cappuccino costs an average 2.13 Euros in medium-class hotels (three stars), top hotels (four and five stars) can charge 2.41 and 3.46 Euros for it, respectively. The average peak prices for espresso in the first-class and luxury hotel industry are 2.20 and 2.71 Euros, respectively. Generally, the following is true for the gastronomy: The more sumptuous an establishment, the higher the coffee prices. In the medium price range (average transaction of eight to twelve Euros), a cup of filter coffee is priced at an average of 1.60 Euros. In top gastronomy (average transaction of over 30 Euros), the cup of coffee costs 2.27 Euros on average. By the way: Coffee has long replaced beer as Germans’ favorite beverage. With an average per-capita consumption of 146 liters per year, the dark, hot beverage is well ahead of the „cool blond“ one with only 112.5 liters per year, now. Presently, the conclusion for small establishments in view of the smoking ban: „Revenue losses of 30 percent on average can no longer be made up for by further cost reduction,“ Fischer revealed (Dehoga-Bundesverband). The fear of the smoking ban is spreading between gastronomers – and rightly so. 58 percent report decreases in revenue, 42 percent complain of more than ten percent of customers lost. Thousands of pub owners, including one-room pubs, are fearing for their livelihood. Guests are coming less often, consuming less or staying away entirely. The success of the branch in spite of the smoking ban depends on the existence of a special section for smokers, even though almost all barkeepers (99%) offer an outdoor area furnished with seats for smokers. New concepts, such as a heated and roofed outdoor area, are arising from the minds of barkeepers and restaurant owners hoping to retain their smoking guests – half of the smokers sit under awnings and heating devices. Those who still do not want to do without a cigarette with dinner are being served in the smoker’s booth in 41 percent of restaurants and inns. In end of July, the smoking ban, which had been inconsistently construed in the respective federal states to begin with, was overturned by the Federal Constitutional Court. The states are now called on to revise their smoking ban laws until end of 2009. They can choose from a general ban and exceptions for, e.g., owner-managed local pubs and discotheques. 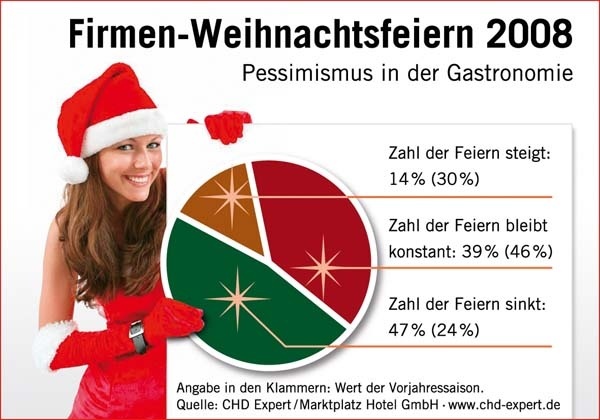 The expected economic crisis is reaching out with its cold hand: The saving trend in the economy is already showing in the gastronomy: Almost half of the restaurants in Germany are expecting a decrease in company Christmas parties this year. With a dropping average transaction, being 34 Euros on average, only 14 percent of gastronomers in German restaurants are expecting more banquets than in the previous year. 39 percent of restaurants are anticipating unchanged bookings, 47 percent are anticipating decreases, even. After the boom year of 2007, a consolidation in banquet and event business can be observed now. 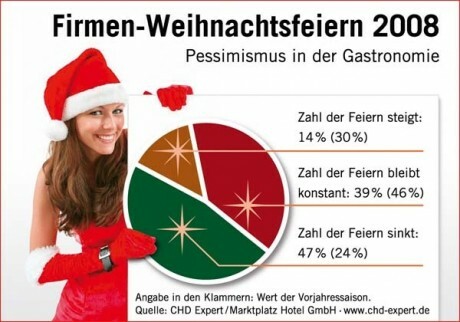 The number of gastronomers with less Christmas parties compared to the previous year has nearly doubled. The gastronomy is facing a gloomy end of the business year. After continuous declines in revenues this year, the cost cutting will spread to the number of participants and the average expenses per Christmas party. Over 43 percent of respondents count less participants per company event compared to the previous year. Only about eight percent of gastronomers can welcome more guests. At least, for 49 percent of establishments, the number of participants has remained constant. The Advent and Christmas season counts to the most important weeks in the year for the industry. ← The Tourism Insider Team wishes all readers merry christmas and a good slide into the new year!